Whenever someone enters your site through another source, typically a link that refers them to your site, a new session is triggered. This also happens if a user is automatically redirected to your site from another source. For example, a user might start a Session on your site, then leave for another site using a link found your site and finally returning to your site shortly afterwards. Google Analytics will count two sessions from this chain of events. Depending on how you define a referral, you might want to exclude certain domains as referral sources so that your Session numbers are not inflated. To quote Google: "A common use for this feature is to prevent third-party shopping carts from starting second sessions. When the third-party shopping cart is in the exclusion list, a user will no longer initiate a new session, and won't be counted as a referral when they return to your order-confirmation page after checking out on the third-party site." This can be an indicator that many of your completed transactions are being attributed as coming from referral sources, most likely the domain of your third-party payment solution. 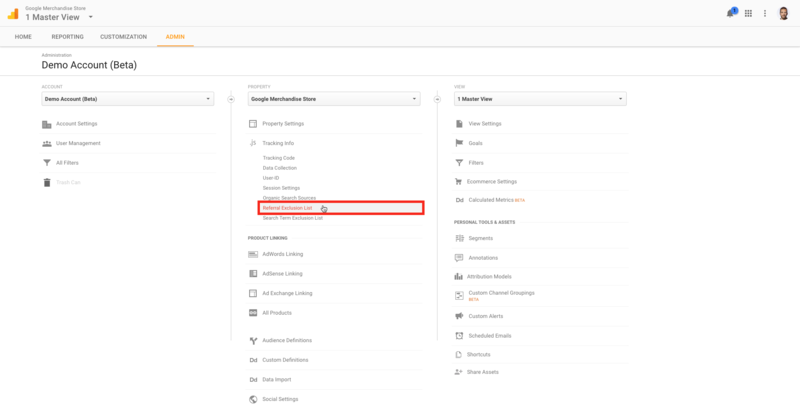 To counter this, all you need to do is make some easy adjustments in the settings of the affected Google Analytics view. Start by going to your Admin page, and looking for Tracking Info in the Property column. Choose Referral Exclusion List. Add a domain that you need to exclude by clicking +ADD REFERRAL EXCLUSION, then enter the domain name. To save and finish up when all the necessary domains have been added, click Create. If you want to read more on the subject in Google's Analytics Help, go here.